The Reading, Blue Mountain & Northern (commonly called the Reading & Northern) is an Eastern Pennsylvania Regional railroad based in Port Clinton, Pa. (on Rte. 61 just below Pottsville). It operates 2 divisions on roughly 300 miles of track. The Reading Division and the Lehigh Division. The Reading Division runs from Reading north and east to Packerton along former Reading Company and Central Railroad of New Jersey lines. It connects with the Norfolk Southern Reading Line at its south end and with the NS’ Lehigh Line at its east end. 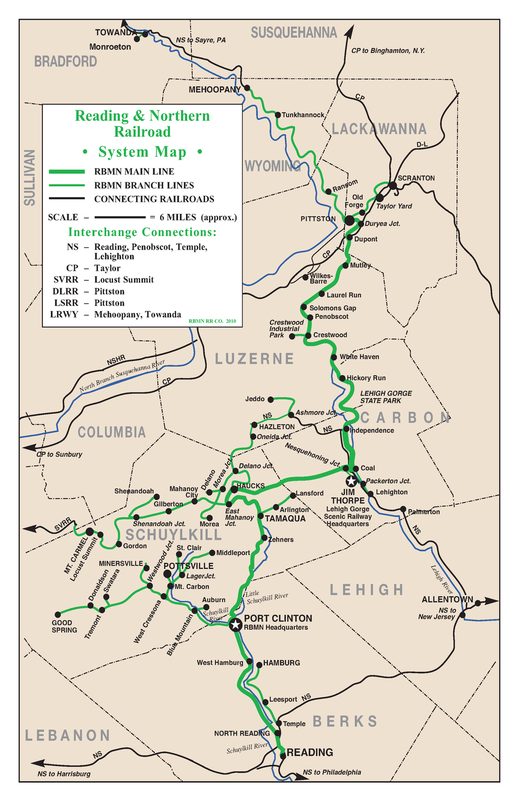 The Lehigh Line forms a fork from Jim Thorpe with one branch running easterly through Nesquehoning connecting to Mahanoy City or Hazleton and the second running northerly through the Lehigh River Gorge to Mountaintop and Duryea Yard (the former Lehigh Valley Coxton Yard). From Duryea the R&N runs north over ex-DL&W tracks to Taylor Yard in Taylor with another connection to NS.